After jogging for 13 miles on a Saturday, I had headed out to Merritt Island, Florida for 2 PM rendezvous on the Banana River. Upon arriving at Manatee Cover Park, Nate, the guide for the day, had introduced us to couple of paddle boards. After getting some instruction, I had hoisted myself topside. Balancing on my two feet at the midpoint of the board, I had started moving across the water’s surface. Paddling out about 50 feet, something unexpected had come our way. Much to my surprise, a manatee had started maneuvering underneath us. According to Nate, they had earned a reputation for being very playful in this area. It had taken about 15-20 minutes for first animal to approach our seafaring vessels. Despite murky brown waters, I had connected on a primal level because of the manatees’ interaction. For an example, one had bumped my friend’s board gazing up with his eyes. That experience alone had provided a new perspective and respect for these docile creatures. Up to this point in my life, the only other mammals that had mimicked this behavior, cats and dogs. Another trait regarding manatees, Nate had mentioned the manatee’s love of fresh water. I had recalled some pranksters using this vulnerability for a means of pulling a childish and illegal act on YouTube. 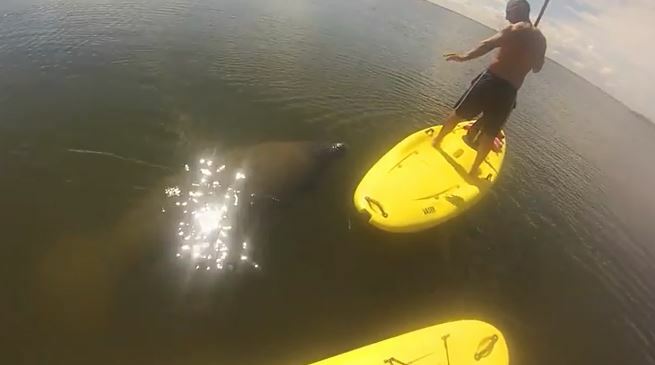 Ending a bit of hide and seek with the manatees, the paddle boarding lesson had commenced. As a group, we had navigated around a protected island for pelicans and their young. Coming around the island and a pair of fishermen, the real exercised had started. With wind coming off the coast, the current had pushed back on the group. The trick in paddling had become apparent by pushing off the right side. The crosswind had pushed back from the left enabling a straight line to our destination. Reaching the halfway point of the excursion, we had moved back up the shoreline. Returning to our launch area , the manatees had presented another opportunity for their playful behavior. With 20 minutes to spare, two pairs of the group had broken off floating around the animals. Coming back to shore, after the two hour adventure, I had enjoyed the paddle boarding considerably more than the passive action of my Crystal River outing. According to Nate, manatee activity had increased along this park with mating season pushing into the fall. Normally, the guided tour had cost $80, but check out pricing on Amazon Local for half the cost. If you hadn’t been keen on this kind of voyage, check out the park from the shore for fishing or just the sunset. Otherwise, I had hoped you consider hitting the road for active cruise on the surface of the Banana River. 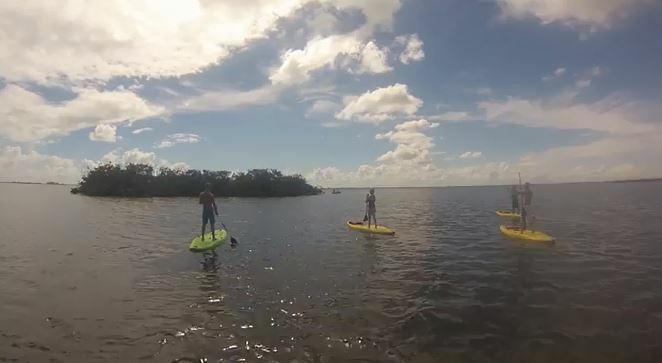 This entry was posted in Central Florida, Travel and tagged Banana River, central florida, Florida, Manatees, Merrit Island, Paddleboarding, Stand-Up PaddleBoarding - Manatee Cove Park @ Merritt Island. Bookmark the permalink.